Kai was lying in bed and snuggled into his soft pillow. He imagined it had beautiful white clouds. Kai looked at the clock. Oh my goodness, it was already 22 clock 30, and yet it was so bright out there, as if someone had lit a thousand lanterns. Carefully, he crept to the window and looked at the big round moon, whose Blasting the trees, shrubs and meadows in a silver blanket wrapped. Everywhere glittered the little dew drops as the many, many asterisks in the sky. What was that? Since moving to something? 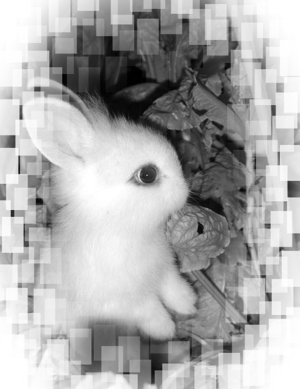 In fact, a small, silver bunny hopped through the middle of the garden. It was directed up and sat on the hind legs. The small ears were moving excitedly to and fro and the little nose sniffing carefully considered it in the air. "Oh," Kai thought, "if only I could have only the rabbit, then I would always have something to cuddle and love have. But certainly this is one rabbit the moon! " Meadow. Whether the bunny was probably still there? Yes, there it sat mümmelte to himself. The fur looked silver and soft cotton wool. Suddenly it was pitch black. A thick black cloud moved in front of the moon. Quay It was felt queasy. "Now is the moon me angry, because I wanted to touch his bunny," he thought. He quickly ran back inside. Fix he took off his shoes, slipped into his bed, and pulled the blanket over his head. Long he was still thinking of the rabbit and saw it even in Dream. The next day, at breakfast, excitedly told his parents Kai the experience of last night. He noticed that Mom and Dad secretly wink. What had the matter now to mean? Whether they had devised a surprise? For soon was Kai's birthday. Every night before going to sleep Kai looked out the window if the "Moon Rabbit" was probably back. So he had that is now called. Too bad it did not come again. "Tomorrow is my birthday", cheered Kai. Excited he could hardly sleep. He dreamed of a chocolate cake with lots and lots of cream and many large and small parcels. Gently he awoke the next morning, Mam. "Good morning, birthday boy, look what we have this morning found the front door!" something rustled; the package moved. Kai pulled his hand back startled. What could just be there in it? Because ...! A small nose was visible. sniffing curiously ventured a cute Rabbit out of the silvery moon large package out. "The Moon Rabbit, Rabbit of the moon!" Kai shouted and hopped from one leg to the others. How pretty it was. It had silver shiny coat, silver as the moon rays and sky-blue eyes. Yes, this bunny was something special. Happy Kai took the bunny on his arm. Now he was no longer alone and had a good friend, he could tell all the secrets. That evening he stood at the window a long time. The moon looked a bit sad, he was only half to see. Kai opened the window and cried aloud: "Thank you. Rather good moon. 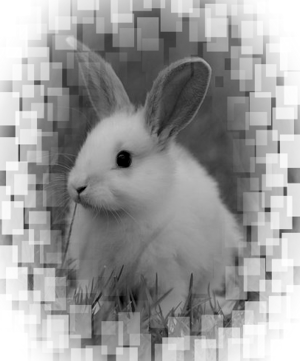 Do not be sad the Rabbit will always go well and you can visit so every night! " Today, Kai was really tired. After he had told his parents good night, He slept a satisfied and happy. The moon looked again into the Children, Kai and his rays stroked the rabbit, then he covered himself with a Cloud and fell forward to a new night.